My Bright Firefly: D is for Dolphin. Spatial Sense - in the Coral Reef. D is for Dolphin. Spatial Sense - in the Coral Reef. Coral Reef cupcakes were a reward for our letter of the week activities! Kids pretended to be dolphins swimming around the coral reef. They practiced following spatial sense instructions while hunting for the treasure in the sea. 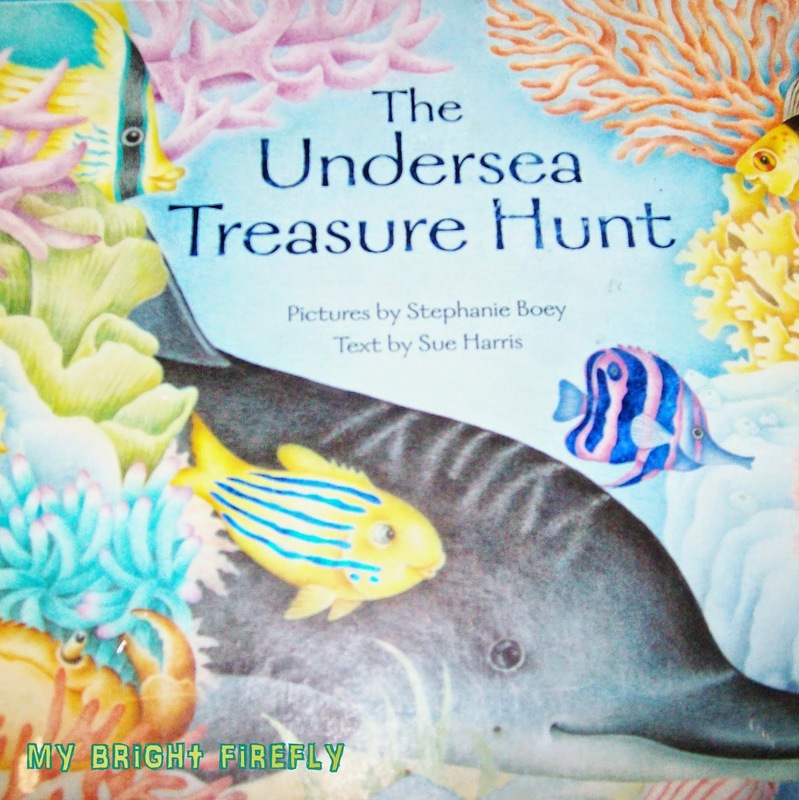 The activities were to bring to life the prettiest book: "The Undersea Treasure Hunt" by Sue Harris. Dolphin, our main character for the letter of the week, went hunting for hidden treasures. This lift the flap book is gorgeous! The flaps - cut outs in beautiful sea weed patterns - cover the shimmering jewels and silver that turn into sea creatures when kids lift the flaps. At the end, readers discover that there is a treasure "far more beautiful" than jewels. It is a coral reef - home for so many! a garden in the sea! as precious as can be! We had our own treasure hunt at sea. Kids pretended to be dolphins swimming around the coral reef. We gave them instructions from the list below. 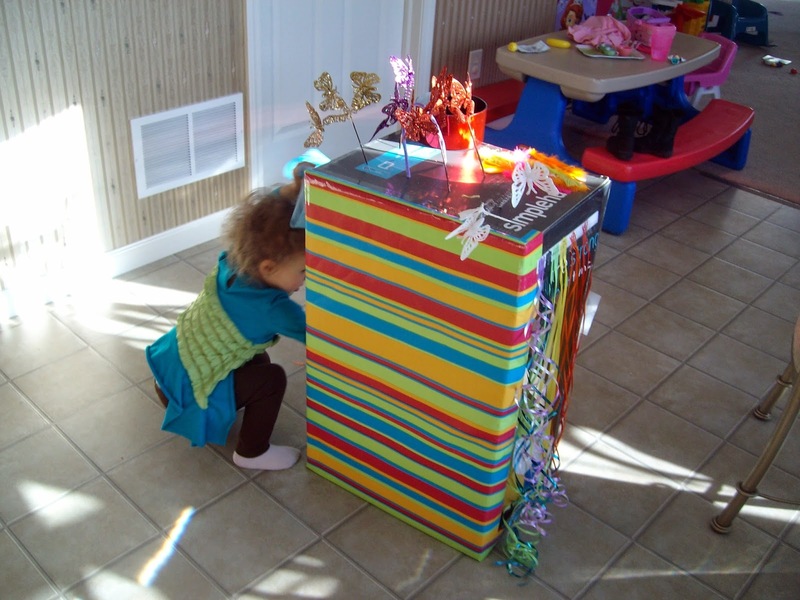 Developing spatial sense is a part of preschool math. In a way, it's not that easy even for adults to find the suitable space for themselves in relation to the world around, lol. For kids, it's understanding of location and position, movement, and distance. up, down, forward, backward, through, around, across, over. 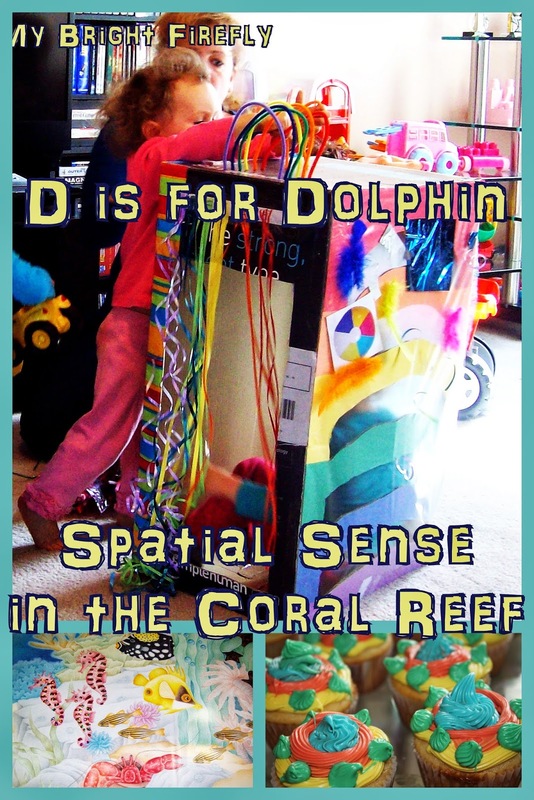 For this activity, we needed dolphins and a coral reef. Dolphin - a laminated picture. 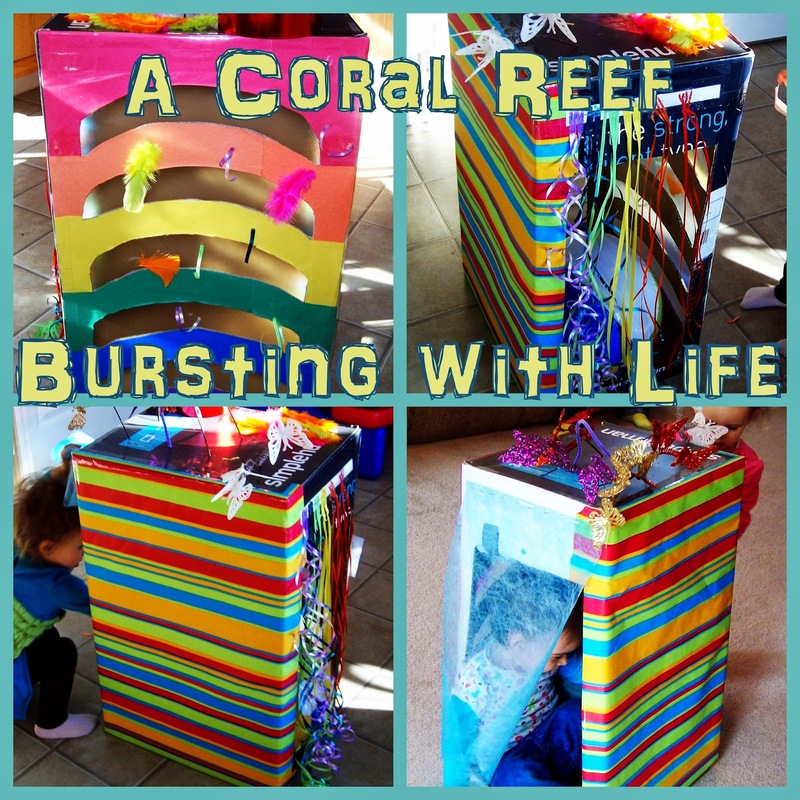 Pictured above, our coral reef is made from a box. I cut out stripes between the colors for added fun. The colors are made of construction paper. Then I covered the whole side with the contact film, sticky side out for the collage activities - our favorite at a time. I prepared different materials with the colors from the book: pieces of ribbon, feathers, pictures, pieces of paper with interesting textures, and stickers. Two rows of holes are premade for inserting the prompts on sticks we had. I cut out the openings for crawling through. I covered one with the ribbons. The other side is covered with the blue mash-like wrapping paper - that should be pretty to look through while sitting in the box. I covered the forth side with the multicolored wrapping paper. We used that side for stickers. 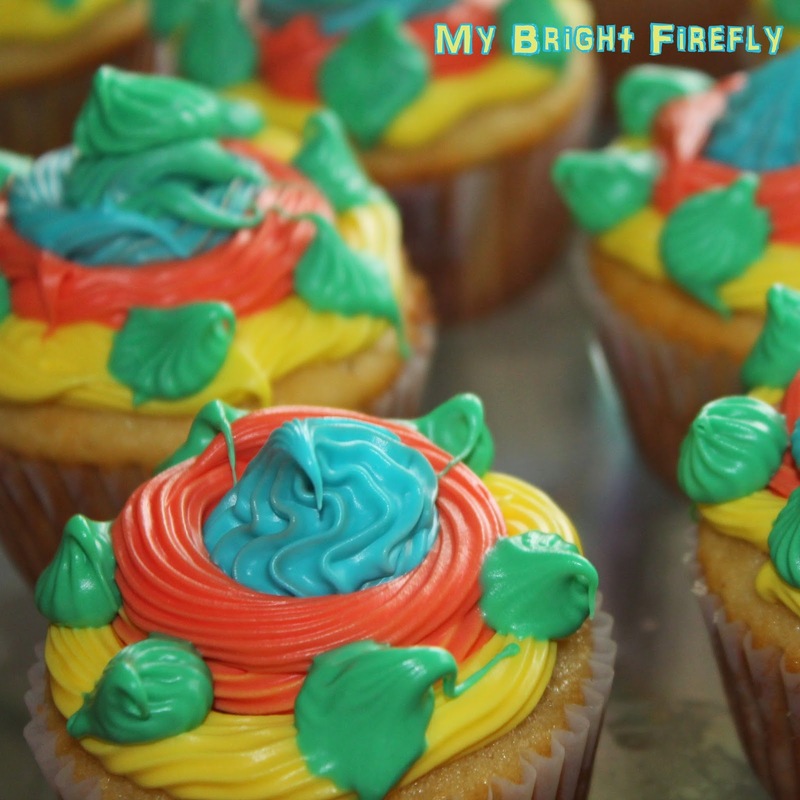 These cupcakes were the found treasure at the end of our hunting. We usually try to avoid colored frosting. This time was a beautiful exception from this rule for the occasion. Well, in case you are wondering, the cupcakes got 2 names: "Coral Reefs", or "Princess Cupcake Castles". To this day, it remains unknown: which name is true? What do you think?